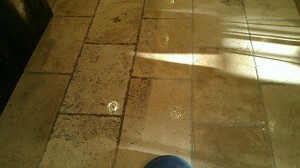 A quick post regarding a travertine floor cleaning that we did in Roswell, GA recently. This style of stone we see more and more recently. It has a cleft edge, but some call them antique edge etc.. Either way, it’s irrelevant, they are treated the same. Most of these floors are simply pressure cleaned, make small repairs and then sealed. Filling holes or voids after travertine cleaning finishes off the project and makes everything look wonderful.